Southern Halo's Catchy "I Think Too Much"
Nashville, TN (September 10, 2018) - Southern Halo's newest single, the catchy "I Think Too Much," is impacting radio today. The much-anticipated follow-up to their Top 50 Billboard Indicator / Top 25 MusicRow single "Anything Is Possible," the track is from their current album, JUST LIKE IN THE MOVIES. Written by Nashville hitmaker Roxie Dean and the band's own Natalia Morris, "I Think Too Much" is a jaunty, singalong that ponders new love and obsession. 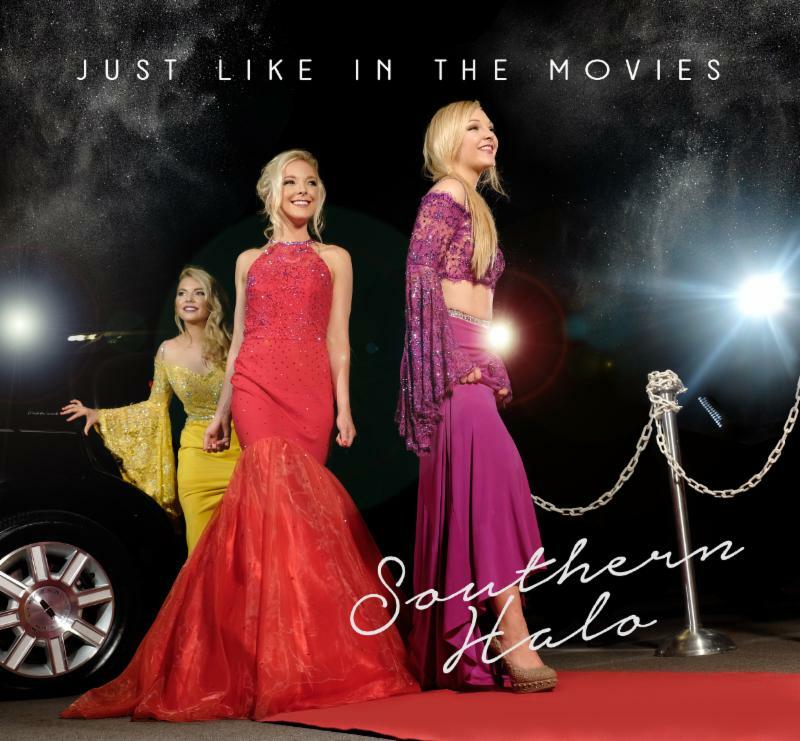 Fun and radio ready, the new release hums with excitement and is the perfect platform for the soaring vocals and intricate harmonies that are Southern Halo trademarks. I hope he isn't late. 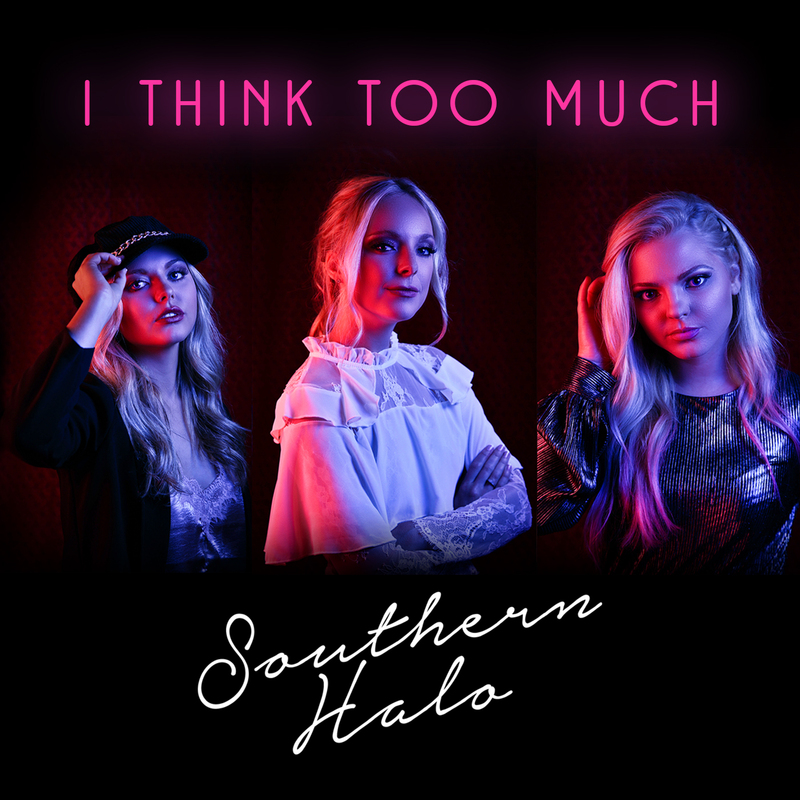 Southern Halo lyric video - "I Think Too Much"
Natalia (principal songwriter, guitarist, lead vocalist), Christina (drums) and Hannah (bass) are SOUTHERN HALO. Since their hypnotically-upbeat Country radio debut, "Little White Dress," caught the attention of U.S. radio and press (spending eight weeks at #1 on the International Hotdisc Chart) this sibling trio has broken down doors and shattered glass ceilings. Their sophomore single, "Rewind," was a U.S. Top 40 MusicRow CountryBreakout™ Chart hit that also held the #1 spot on the Hotdisc Chart for two weeks. The group's third single, "Living Like That," quickly found success of its own. Those three singles, from the group's previous CD, SOUTHERN HALO (2015), further bolstered the trio's profile. Since landing in the National Finals of the 2014 Texaco Country Showdown as the youngest competitors ever, the band has opened for Maren Morris, Phil Vassar, Deana Carter,Love and Theft, Brantley Gilbert, Eric Paslay, Tyler Farr, Parmalee, Old Dominion, American Young, Blues immortal B.B. King and legendary chanteuse Dionne Warwick, among many others. The Cleveland, Mississippi natives have performed at a pre-show on the rooftop terrace of the Grammy Museum in Los Angeles and launched Townsquare Media's Say It With Pepsi Concert Series. They entertained fans at CMA Music Fest 2018 and 2016, and have twice toured the U.K. When they are not on the road, the Morris sisters now call Nashville home.